When cartoonist Bill Watterson announced that his phenomenally popular cartoon strip would be discontinued, Calvin and Hobbes fans throughout the world went into mourning. Fans have learned to survive -- despite the absence of the boy and his tiger in the daily newspaper. It's a Magical World delivers all the satisfaction of visiting its characters once more. Calvin fans will be able to see their favorite mischief maker stir it up with his furry friend, long-suffering parents, classmate Susie Derkins, school teacher Miss Wormwood, and Rosalyn the baby-sitter. It's a Magical World includes full-color Sundays and has it all: Calvin-turned-firefly waking Hobbes with his flashlight glow; courageous Spaceman Spiff rocketing through alien galaxies as he battles Dad-turned-Bug-Being; and Calvin's always inspired snowman art. 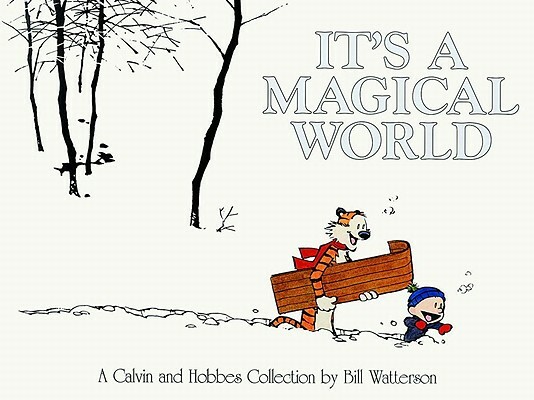 There's no better way for Watterson fans to savor again the special qualities of their favorite strip.